Newton has excelled in the footwear space due to their increased attention at the midfoot area. Their design patterns expand upon modern physics, producing the correct means of foot striking and push-off from your runners. The Newton Distance III takes a turn in approach to increase the notion of applicable means for sustained running. The new design allows for lightweight materials to be met with ground striking capabilities that benefit the user's strides, distance capabilities, and overall comfort means. Below is a comprehensive review of this product. We will detail the spaces where this model excels and present cases for improvement. We will also detail the specific shoe features that make up this model, providing in-depth content to assist in the selection process. With the steps taken to advance upon previous models and designs, the Newton Distance III creates a sound build. The implementation of the fifth lug helps create the even balance and sound structure that previous models have lacked. The 3-layered outsole support system works to keep you comfortable and stable across a multitude of surfaces. The mesh design makes for the perfect lightweight fit. This shoe built upon their previous models and designs, with the result ending in success. Check Price on Amazon! Newton has produced numerous models in the footwear space. Their claim to fame relies on the undercarriage of their models. The outsole of their shoes features extended lugs that directly benefit the midfoot area. These lugs are designed in wide stripe fashion, which allows for pressures to be met with ample resistance. This inclusion works to help users sustain their instances of push-off and ground striking as they complete a run. Their strength makes them an effective mean for long-term running commitments or training for long distance travel. To meet consumer needs, the company designed their third installment with the inclusion of a fifth lug. This inclusion was created on a scientific basis, with testing results favoring the additional lug. This lug proves to increase stability means, providing an even amount of support spread through the midfoot area. The previous models contained too much spacing between lugs, often producing wear and tear after minimal usage. This simple step improves sustained design means for the user, preparing them for long-term support and strength means. The mesh material holds a prevalent coverage rate with this new model. Previous models built upon the rubberized component, often increasing the total weight of the shoe. This newly implemented coverage technique gives the shoe a lightweight title. The tongue of the shoe also sits plush to the top of the foot, reducing discomfort and irritation derived from a spread-out tongue. Previous models utilized an enlarged component, often creating for some discourse in the lockdown support provided. These areas highlight some of the changes the company has made to meet the proper approach streams. These inclusions work to provide sustained support and long-term usage, which are two important means for running shoe success. Due to the forgiving nature of the design, the shoe fits rather close to size. If you have any concerns about the size component, adjust upwards by one-half size. This will provide you will a little more room in the toe box and compliment the sides of the foot with width adjustments. The fit remains snug, due to the differing holding means. The most beneficial holding pattern extends from the plush tongue and the padded insertion point. The insertion point features an all-encompassing padding that extends overtop the collar. This reduces slippage and rattling, keeping lockdown at a high level. The most intriguing portion of this model is the design of the outsole. The outsole introduces the fifth lug in the undercarriage region. This inclusion helps to spread the shock absorption, creating more even-keeled pressure amounts. This helps with stability and generating the proper striking and push-off during your cycle. The outsole is made up of rubberized elements. These elements stack near the undercarriage, which represents the starting point to the lug extensions. The comfort levels emitted from this padding technique helps to prevent injury and discourse from long runs. It helps you create sustained patterns of movement and promotes the use of the midfoot area and front of the foot, which helps create the proper running strides. The midsole is stacked upon the outsole in a thin layer. This implementation makes for a great source to creating a balance between shock absorption and comfort means. It is comprised of rubberized material. It is also responsive to movement, meaning it caters to your stride type and affords you the benefit of increased support in the needed facets. It runs from the front of the foot to the heel, increasing the coverage to expand upon the entire foot. It also extends beyond the back of the heel with the outsole, creating the proper base for support. This extension helps the midsole cater to all areas of the foot and creates a stronghold over the back ankle/heel area. The upper is treated with the mesh means that make up the outer shell. The upper also includes a stitching pattern that introduces a ridge of support surrounding the insertion point. This simple facet allows for proper lockdown in the ankle area, directly reducing slippage or any unwanted movement. The back of the upper is treated to a shank design that extends to the outsole. This keeps your movement stream in the correct, upright position. This also helps to promote the proper posture, helping you to nail down your correct stride pattern. The lightweight fixation is carried with the many different facets of the shoe. It starts with the mesh material that makes up the outer shell. The rubberized outsole is thick, but it introduces spaced out coverage, which keeps the weight of this area low. This also helps to limit foot pounding, which helps you to glide across your surfaces. Even the laces boast a lightweight title. 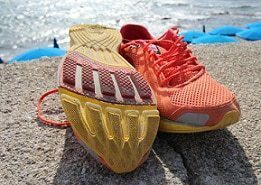 The total weight of the shoe comes in at just under 8.8 ounces, giving the user that close-to-the-ground feel. This is also a proper weight amount for those who look to gain minimal running techniques. The user is kept close to the ground, allowing them to adjust for surface means and master their strides. The mesh surrounding features small dimples and holes throughout. This allows for the entire foot to breathe comfortably. When this feature is accompanied, it often creates sacrifice in weather protection. The Newton design allows for positive air flow and directly reduces the absorption of fluids. This model is water resistant, meaning you can wick away this element with ease. The insertion point features an all-encompassing padding technique. This keeps a solid hold on the ankle area, but still promotes the positive direction of air flow. Comfort means are implemented through different variations in this new design model. The main instance surrounds the lug inclusions. These extensions are derived directly from the outsole, creating a component piece that works in conjunction with the outsole. The primary area of effect with the lugs occurs that the midfoot area. This area is raised from the ground during running, allowing the user to focus their attention on creating the proper strides. This extension also makes up for the absorption means for other portions of the foot. The toe box is also revamped with the outsole extending will into this area. This promotes proper footing and push-off from the front of the foot. The back of the outsole is raised to meet the proper ankle/heel support means. This thick structure meshes with the extensions and toe box coverage to produce little feel from your striking and adverse surfaces. This shoe is designed with means that promote durability. Skeptics can rest at ease with the lug inclusion. Most believe that these extensions will wear over time. Due to their design and spacing, the scientific nature surrounding these pieces reduces any wear and tear that would be prescribed. This area is also resistant to debris and dirt, defending the undercarriage from clogging. Strategic stitching is implemented throughout the outer shell, which creates for a strong bond between materials. 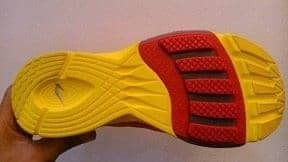 The rubberized components are fused to the other portions of the shoe, which holds these elements at a strengthened pace. The recommended area of travel is on flat and hard surfaces. The design elements promote usage on these surfaces to directly benefit the user's running pattern. It allows for positive stride development, creating the notion for long distance runs. Trails and uneven surfaces are also areas where this shoe can host success. Then rocky and debris filled areas represent the locations that should be avoided if possible. The stability means are pronounced throughout this model. Ranging from the heel shank to the layered outsole, stability surrounds the foot in many instances. The heel shank helps to promote proper footing. The insertion point works as a solid grip for lockdown support. The outsole, when combined with undercarriage extensions, works to keep the proper striking on any surface. The insert of the shoe is also even-keeled, allowing your foot to sit naturally within the shoe. Since the shoe is comprised of mesh materials, it emits the proper flex in the correct places. The front toe box is rather thin when it comes to outsole and midsole coverage, which creates the proper upward bend. You want to see flexibility in this area, as hard surfaces could put your toes at risk for tearing and blisters. The back of the shoe is reinforced and built-up, representing the proper platform for hosting heel support. 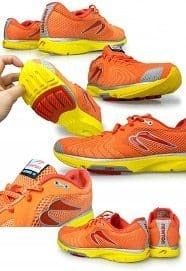 It offers little flex, which is the proper pairing technique for a solid running shoe. 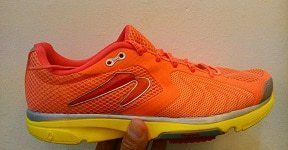 The main use of this shoe is to help runners develop their stride. The product inclusions help to promote even stride patterns. It also helps with development of landing technique. This compiled notion helps make these runners the perfect fit for those who are training in long distance fashion. Short distance runners will also benefit from the included support and comfort means. These shoes help keep your foot fully supported and catered to at the exact pressure points. Combating these elements makes for a shoe that can stand up to the most rigorous of training routines. Size availability, width changes, and other such elements of discourse can sometimes prove difficult to obtain. To combat this hassle, we have created a small list of comparison products to revert to if this model is unavailable. The Newton product line expands in many different directions, with running shoes remaining constant. The Fate design encompasses many of the design means that the Newton Distance III holds. It is comprised of the same mesh materials, with stitching to represent the stronghold of a durable build. The outsole is the main area of difference. It offers a pattern that includes the use of the 5-lug technology, but there is additional extension means that meet similar strands of lengths. These additions extend to the heel area, creating an extension base that almost covers the entire bottom foot. This product line is also made available in many different color schemes, sizes, and widths, making it a fitting comparison product. Sticking with the Newton brand, we have the Sir Isaac model. This model holds the classical build of the 4-lug format. This format was criticized for means of spacing, which is something the Sir Isaac makes up for. The back of the heel features outsole extensions. These extensions occur in a side-by-side design and they meet the ground with the midfoot lugs do. This helps to cater for the limited spacing in the midfoot area, hosting this correction at the heel of the shoe. This shoe weighs a little more than the Newton Distance III, but still builds upon the mesh material make-up. 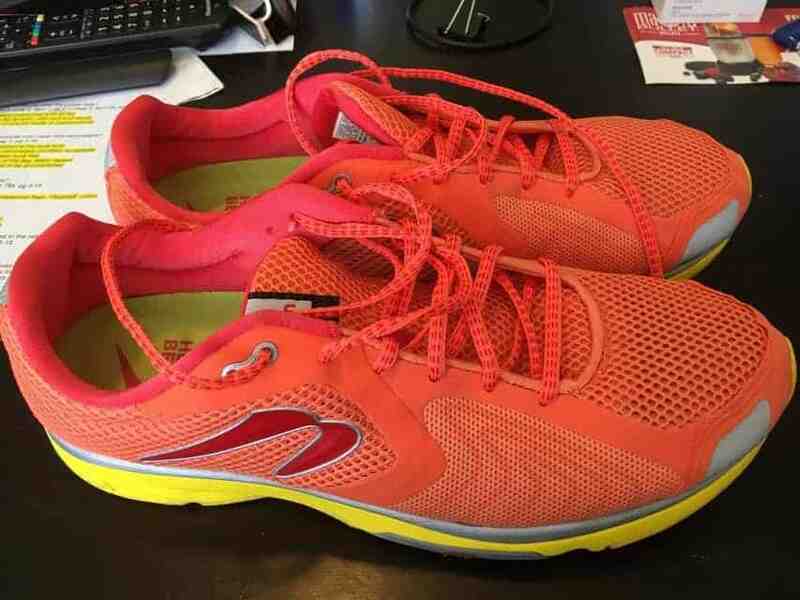 The last Newton product for comparison is the Momentum trail runners. These shoes utilize the 4-lug format. The spacing concern is met and addressed by the back-heel base. This base features the same lug extensions in the undercarriage, with 10 different triangular shapes taking form. This design helps to create extension means that can create stability across a multitude of surfaces. This shoe is designed with nylon materials, which still promote the lightweight fashion users can enjoy from a trail running option.